Juggling motherhood, marriage, and a career while not loosing touch with yourself. Family, parenting tips, style and fashion, career, quick recipes more. This what your Working Mommy Secrets Blog Ad will look like to visitors! Of course you will want to use keywords and ad targeting to get the most out of your ad campaign! So purchase an ad space today before there all gone! The month of October is one of the coolest months if not the best month of the year. Pumpkin spice flavor everything – lattes, pies, beers, yogurt, cereal etc etc etc. Playing dress up – You get to dress up as your alter ego… what do you want to be this month? Halloween Parties – For kids and grownups! Scary 80’s movies marathon – Because even though you have seen them a million times, you still watch them every October. October sets the tone for the holiday seasons – Because after Halloween the holiday season fun begins! Do you have a favorite month? If so please share what your favorite month is on the comment section below or on my facebook page. The post I love October appeared first on Working Mommy Secrets. Low Carb Pumpkin Spice Latte What better way to celebrate the first day of fall than with an awesome pumpkin spice latte? If you know me well, you know I love pumpkin spice lattes… or P-spice lattes as we like to call it in our house. Every year I look forward to September for Starbucks to bring it back (yes these pumpkin spice lattes have a following). I have been craving one all week long… however this fall I’m on a low carb diet and Starbucks’ pumpkin spice lattes are loaded with sugar. 36g of sugar for the Tall size, 50g for a Grande, and 66g for a Venti to be exact. Last night I was telling my husband how badly I wanted one… So this morning I had to improvise. I woke up early and went straight to the kitchen, as if I had dreamed about it all night or something… Lucky I had everything I needed available! It turned out so good I had to write this post and share with you. Combine heavy cream and pumpkin in a saucepan over medium heat and stir constantly. Stir in Splenda and spices. Heat just until boiling. Pour mixture into blender and process on high for 20 seconds. Garnish with whipped cream and a dash of cinnamon. The post Low Carb Pumpkin Spice Latte appeared first on Working Mommy Secrets. Next month will mark my 10 year anniversary with my current employer. That means review time… in my case a self review. As I think about my tenure with the company, my achievements, missed goals, lessons learned and so on… I can’t help but think back on all the performance reviews I have conducted and reviewed with my subordinates and managers through the past 10 years. Annual performance reviews can be terrifying, intimidating, motivating, and all of the above., and not just for the employee, but for their manager as well. Depending on your company and manager, your performance review meeting can be an opportunity to evaluate your year, set goals for the upcoming year, and understand the company’s direction, your current role and its growth potential. Take advantage of this opportunity! Don’t let your superior run this meeting and do all the talking. The annual review is probably one of the best opportunities for growth within the organization. My experience has been that the top performers will ask key questions that allow them to get to the bottom of the company’s vision, my vision as their manager, and ultimately allow them to successfully position themselves for a successful year. Practically, the questions asked by some memorable employees have both impressed me and led to a more productive conversation for the employee. So… What to Ask During Your Next Performance Review? Here is a list of straightforward questions that will allow for a more candid and honest conversation between you and your manager on your next performance review meeting. These questions will not only allow the conversation to be 50/50 but will let your manager know that you are really interested in improving yourself and growing with the company. – What specifically can I do to improve my rating next year? – What would you recommend I do to be more helpful to the people on my team? – What are your most important goals for next year? – What knowledge or skills do you think I may need to develop in order to meet my goals and improve next year? – I’ve been in this role for X years and am looking ahead. What kind of advancement do you imagine for my position? What is your estimated timeline? – What are some of the company’s goals and its vision for the next year? Five years? – What can I do to make your job easier? – What should I continue to do? – What should I start doing? Have a performance review coming up too? Bring these questions to your meeting—your manager will be impressed with your dedication and preparation. Good luck and let me know how it goes. The post What to Ask During Your Next Performance Review appeared first on Working Mommy Secrets. You are one busy mommy! Long hours at work, long nights up when your child is sick. Long commutes, last minute stops at the supermarket to get milk. Soccer practice, ballet recitals. Parent/teacher conference, business conference calls, angry bosses, and you find find yourself spread thin. Let’s not forget your hubby begging for your attention too. You can’t seem to catch a break. Ah if life was like in the movies… you could just yell CUT! If you are a working mom, here are 4 Inspirational Working Mom Movies you Must See. These 4 women are smart, determined, strong, and loving mothers that figure out how to make it happen… and they do it all while looking darn cute too. So this weekend, if you get a chance… rent one of these inspiring movies. I promise that in between laughs and tears will relate in more than one way. As an employee at a Boston-based financial firm, Kate Reddy (Sarah Jessica Parker) struggles daily to balance the demands of her high-powered career with the needs of her husband (Greg Kinnear) and children. She gets an account that requires frequent trips to New York and her husband gets a new job. Complicating Kate’s life even more is new business associate Jack Abelhammer (Pierce Brosnan), who throws temptation into the mix. The post 4 Inspirational Working Mom Movies you Must See appeared first on Working Mommy Secrets. Helping your children enjoy reading is worth the investment of your time and energy. Kids will learn reading skills in school, but often they come to associate reading with work, not pleasure. As a result, they lose their desire to read. And it is that desire—the curiosity and interest—that is the cornerstone to using reading and related skills successfully. I’m one of those kids. When I was little my parents were readers and as such they wanted me to be a reader too. Unfortunately… reading became a shore, a task, something I kind of had to do and was expected to do and like most kids would, I lost interest. As a teen, then reading became a need… I would read books just to learn and practice my English. One time, my dad gave me “The millionaire Mind” and said… “As homework, practice translating the first chapter”. He had the best of intentions… but the method was not very enticing when teens just want to hang out with friends or maybe just read for fun. Then came college and reading again was for knowledge and projects, not for recreation. Now as an adult my desire to read lit up again. And as a mother my desire for my child to to love reading. As a result I bought a Kindle a few years ago and it has become one of my favorite gadgets ever! By far the most effective way to encourage your children to love books and reading is to read aloud to them, and the earlier you start, the better. Even a baby of a few months can see pictures, listen to your voice, and turn cardboard pages. Reading should be fun! As parents if we want our kids to love reading, we have to entice them to it. Identify your child’s interest and buy books based on that. Freedom of choice is a key to getting them motivated and excited. Ask genuine questions, ones to which you do not already know the answer. Ask questions that help children think about why and how and not just what. Be sure to listen to their response carefully and build upon what they have to say. Build their book collection based on their interest. Then you can other types of books add here and there to continue to expand their curiosity. Organize a bookshelf for your child’s book collection. A sturdy bookshelf or cubby located in an area accessible to your child is ideal. This way, they can reach their books and use them without having to ask you every time. Having a special place for their books will also demonstrate to your child that books are valuable. Create and continue a frequent read-aloud routine. Whether it is daily, or weekly before bed time, Wednesdays after dinner, or every Saturday at 2:00pm… Create a reading routine that works for you and your family. This will help you stick to it. Reading at the same time each time and in the same comfortable place, such as in bed or on the couch, make read-aloud a time to anticipate. I like to read to my daughter before she goes to bed and she looks forward to it. Point to the words when you read aloud. You need not do this for every page but pointing to the words in the book’s title, or to the words of a repeated phrase in the book, is a good idea. When you point to the words, you show your child that there is a correspondence between spoken and written words and that print goes from left to right. The best role models are in the home. Fathers, mothers, sisters, brothers, grandparents etc. I love my kindle, however I find myself having to explain to my little one that I’m not on an iPad, and I’m actually reading a book. One of the most effective ways to help children become readers is to show them through your own example that you value literacy and that reading has useful purposes. Make sure that you have a variety of printed books in your house and you use them on a regular basis, and that you talk to your child about what you are doing when you read. Remember… monkey see, monkey do. The post Getting Your Child to Love Reading appeared first on Working Mommy Secrets. How many times a day do you pump or spray some hand sanitizer on your hands or your kids hands? Commercial hand sanitizers are usually laden with chemicals, heavy fragrance, and alcohol. These always dry my hands because of the alcohol in them. Also, commercial hand sanitizers kill all bacteria including the good bacteria. I was thrilled when a friend gave me a sanitizer she made using dōTERRA essential oils! I have been using this recipe for almost a year and I love it. It is non-toxic, 100% natural, and SAFE! These essential oils have tons of antibacterial, antiviral, and anti-fungal properties! This Do It Yourself Hand Sanitizer Spray is super easy to make and is very cost effective as one drop of each oil goes a long way. I am super happy to share this with you because I know you will benefit tons from it and end up loving it as much as I do. Add the essential oils to a 15 ml glass spray bottle and top off with distilled water or fractionated coconut oil (or both). This is an amazing substitute to the alcohol based store bought sanitizers. You can spray on hands, your kids hands, grocery carts, restaurant tables, etc. It will kill germs and bugs that are resistant to antibiotics keeping your family healthy all year long! The post DIY Hand Sanitizer Spray appeared first on Working Mommy Secrets. 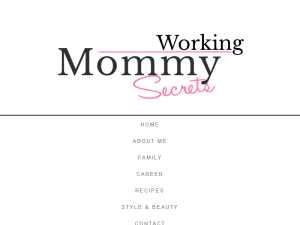 If you are the owner of Working Mommy Secrets, or someone who enjoys this blog why not upgrade it to a Featured Listing or Permanent Listing?